Peel Lifestyle Outlets are taking forward plans for a £100m retail-led destination at Glasgow Harbour with the submission of new plans for a 350,000sq/ft mixed use development. 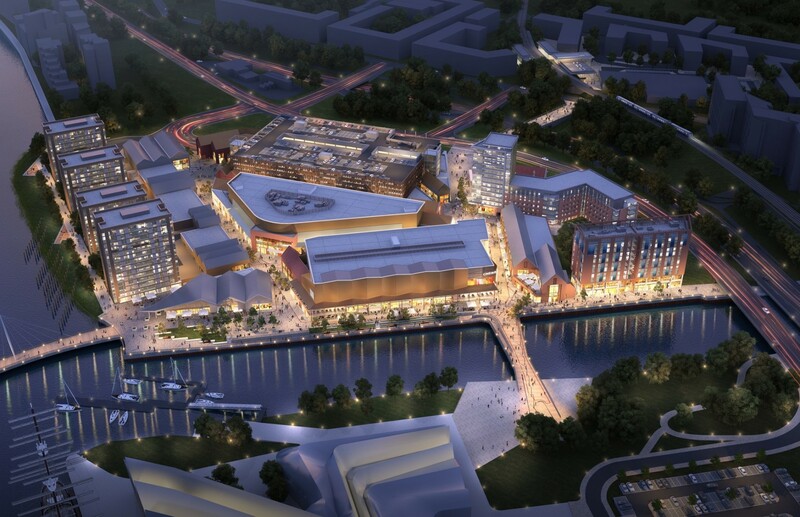 Incorporating shops, a restaurant, cinema and cafes the project is being billed as a new ‘waterfront destination’ for the west end, with the promise of its own events, activities and performance programme. The team also pledge to leave 40% of the 74 acre site as public open space to make the most of both waterfronts along the River Clyde and River Kelvin. This will include connecting promenades, a public square, events space and pedestrian link bridges. The new retail park will be joined by bars, a gym and homes as part of the latest element of the Glasgow Harbour masterplan. It is scheduled for completion by 2021. Is this seriously being considered given the affect out of town shopping has already had on our bomb site city centre! Terrible idea! Object and plant trees instead!! this would be a great idea for this gap site that has laid empty for so long. People can walk from the west end and enjoy the river once again. 1 PRO. Excellent, reduced ground level car parking. It is about time that UK developers realise that cars are not the only mode of suburban transport. This site offers excellent bus, rail and subway links through the Partick Interchange, and if we are particularly ambitions, that lovely sliver of empty water that runs right through the city can be used too - it has always surprised me that a city with such congestion does not find a way to utilise the river to a greater extent. I would like to see improved cycle access and storage though. 2 PRO. Excellent, a link to the south of the river. Govan is already becoming a decent place to spend some time. Linking it to the West End will increase investment - and maybe some West Enders will venture 'down there...'. 3 PRO. Excellent, Glasgow Harbour won't be so sole-less. That is a terrible development. Sorry to all those who live there and love it - but it is awful. A little more life will do it the world of good. 4 PRO. Excellent, another bridge across the Kelvin. More interaction with the forgotten rivers. 5 CON. 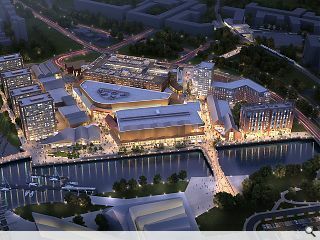 It probably won't look anything like this and have a huge car park causing traffic misery for the area. 6 CON. Bridges just to make the pictures look pretty that will never be built. I'd be much more excited about this proposal if I hadn't heard almost exactly the same stuff being excitedly touted fifteen years ago, before any of the Glasgow Harbour flats were built. The only thing that's happened on this site in a decade and a half is Scotway House 'mysteriously' burning down at the second attempt. Mmm.... retail in the city centre struggling and 6 cinemas within a few miles of each other, something has to give. Cinemas at Clydebank, GFT, the Quay, Braehead, Cineworld, St Enoch. Not to mention The Fort, Siverburn and the IMAX and the Grosvenor. Can Glasgow sustain another cinema 7 days a week? Rather than offer another cinema , maybe something to make us more active? A leisure complex with golf lounges, climbing walls, ice rink and ten pin bowling? In better weather with its proximity to the Clyde, water ski-ing? Boat trips up and down the world famous river taking in the city centre to Dumbarton rock. The answer to filling a site should not be.....’oh I know let’s build more shops and a cinema’. And did we ever find out who was responsible for that beautiful listed building going on fire on this site? Well this is certainly a slightly better variant of the last submission, hopefully ADF have seen sense for such a landmark site. However fully agree with #3, please don't drive this into the ground once you have permission as this world class location deserves better than a few tin sheds, car parks and student flats. #9 stay off the sauce son, you've gone a bit mental.